CHEONGJU, South Korea -- Buddhist temples are not usually considered as hotbeds of technical innovation, nor are nuns hailed as champions of advanced technology. But at Korea's Heungdeok Temple in 1377, a group of Buddhist monks challenged that assumption by producing what has been recognized as the world's oldest book printed with movable metal type. The small temple no longer exists today, but its legacy of the precious book "Jikji" continues to fascinate the world, because it predates the Gutenberg Bible by nearly 80 years in terms of how it was produced. Movable metal type printing, credited by many historians as revolutionizing the way people published and spread knowledge and ideas, played a pivotal role in ushering in the modern age. It enabled Europeans to mass-produce books at affordable prices and brought an end to the exclusive access to the Bible powerful medieval priests enjoyed until the 1450s. "Gutenberg's work with movable metal type was enormously consequential in Western history, on a scale comparable to today's digital revolution," said Heinz-Dieter Kittsteiner, a professor of modern European history at Frankfurt University. "Many would say it even sparked the Renaissance." 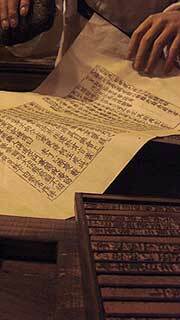 If the Gutenberg Bible helped bring down social barriers and led to major upheaval in Europe, Jikji mainly focused on the teachings of Zen Buddhism that aim to overcome human psychological anguish and reach inner freedom. "Its basic message is simple: free your mind from social status and agony, and you will find your true self inside," said Seong-hae, a master monk at the Seoul-based Jogye Order of Korean Buddhism. Jikji, which means "to point to the right direction," was originally printed in two volumes, but today only the second volume remains and is stored in France's Bibliotheque Nationale, or National Library. It is believed to have been brought to Paris by a French diplomat and publisher, Collin de Plancy, who came to Korea in 1886 after the two countries forged a trade pact. After reappearing at an international book fair in France in 1972, the work drew global attention, prompting experts to rewrite the history of printing. It eventually encouraged the Paris-based UNESCO to designate Jikji as a Memory of the World in 2001, a program aimed at preserving and disseminating the world's key documentary heritage. "It startled the world because no one thought an obscure Far Eastern country would have developed metallic printing far ahead of Gutenberg," said Yoo Chang-jun, a senior publisher at the Korean Printers Association in Seoul. 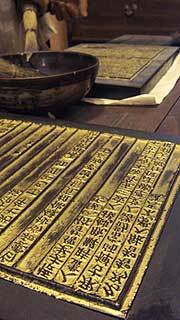 The printing of Jikji would not have been made possible without the financial and spiritual backing of a female monk named Myo-deok who historians say is believed to have turned to Buddhism after becoming disenchanted with her life in the Goryeo dynasty royal court. "It is interesting that a female monk stood behind one of the world's most revolutionary advancements," said Lee Se-lyoul, a history expert at Jooseong University in Cheongju. "Records show she devoted herself to several independent printing activities that would have been impossible without her wealth and influence." Korea's movable metal printing technology came at a time when Mongolian invasions ravaged the nation, destroying many of the Goryeo dynasty's legacies, including its traditional woodblock printing. Yet, despite the hostile regional environment, Korea managed to keep its advanced printing technology intact and continued to publish books and documents deemed essential to its cultural and spiritual heritage, said Ra Kyoung-jun, a curator at Cheongju Early Printing Museum. "The fact that even a small temple was publishing books with movable metallic printing indicates the technology was already widespread across the nation," he said. Eva Hanebutt-Benz of the Gutenberg Museum in Mainz, Germany, even suggested that the Korean printing technology behind Jikji may have influenced Europe and Gutenberg himself. "Historians have wondered about the possible influence from the East on the invention of printing in Germany, and the Mongol khanates stretched from Korea to Europe," she said. "So it is possible that knowledge of the invention reached Europe, although there is no evidence so far to corroborate this." Expanding on the historical significance of Jikji, UNESCO established a UNESCO/Jikji Memory of the World Prize in 2004. The biannual award is given to individuals or groups who have made significant contributions to the preservation and accessibility of documentary heritage. In June last year, the Vienna-based Austrian Academy of Sciences received the US$30,000 award for its commitment to the preservation of audiovisual research archives, the UNESCO Web site said.